According to several sources, Microsoft is apparently finally going to reveal Windows 9 on the 30th of September. The tech-giant has long been said to focus more on the desktop again with this next big iteration of Windows, though I�m not entirely sure how many new features will be included apart from what was initially already previewed as features of the ditched Windows 8.2 update. 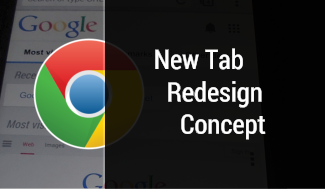 I guess it�s rather hard to come up with great changes to an interface that hasn�t changed much since decades and that you might even think of as perfect. Nevertheless, Microsoft did an overwhelming job with Windows 7. A lot of small enhancements, add-ons and adjustments to old elements made it a great evolution of the desktop and a big step forward for Microsoft. The feature I want to present you within this article - the so-called Pin-feature - is also just one small update. 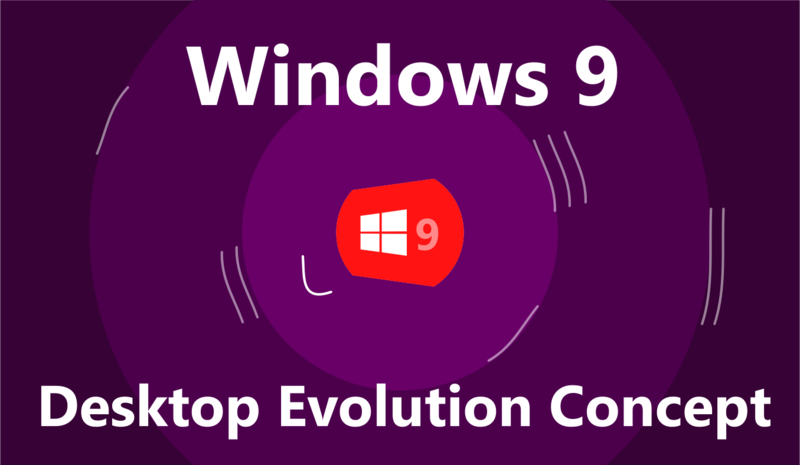 This concept is really not about guessing what Windows 9 will actually look and work like - you know, Start Menu, Windows Store apps on the desktop, live tiles in the status bar - but only about explaining this one idea and discussing its impact and advantages. The feature could work as well next to all the more likely changes coming to Windows. It might not even be specifically restricted to Windows 9, but would be a great addition to any desktop OS. 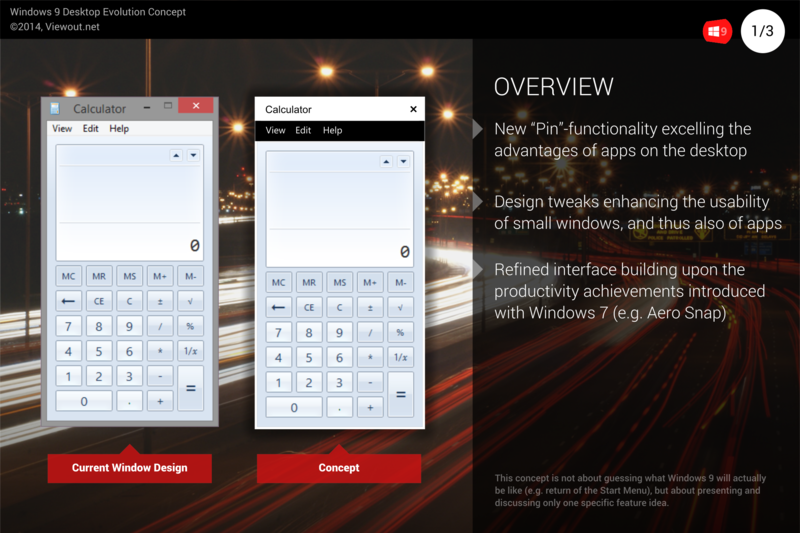 I've also already published another concept also imagining what Windows 9 might look like a few months ago. 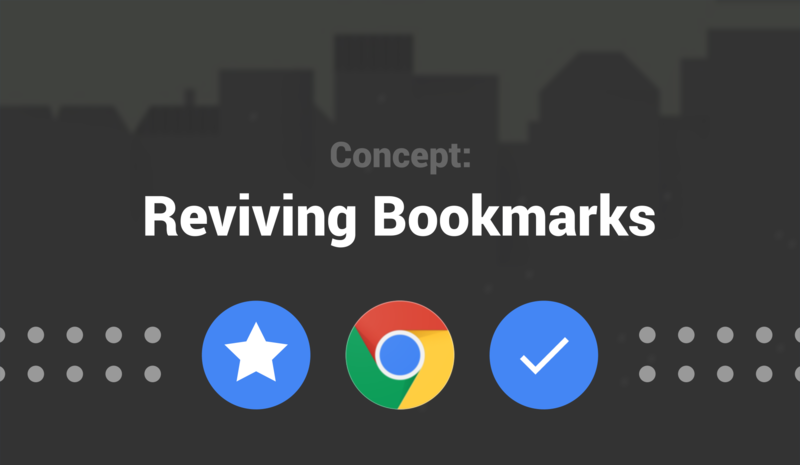 These two concepts are completely independent from each other, though, since the first concept only concentrates on a separate touch-interface, and since this concept here only focuses on the small pin-feature for the desktop, both concepts could of course actually be implemented within the same OS. 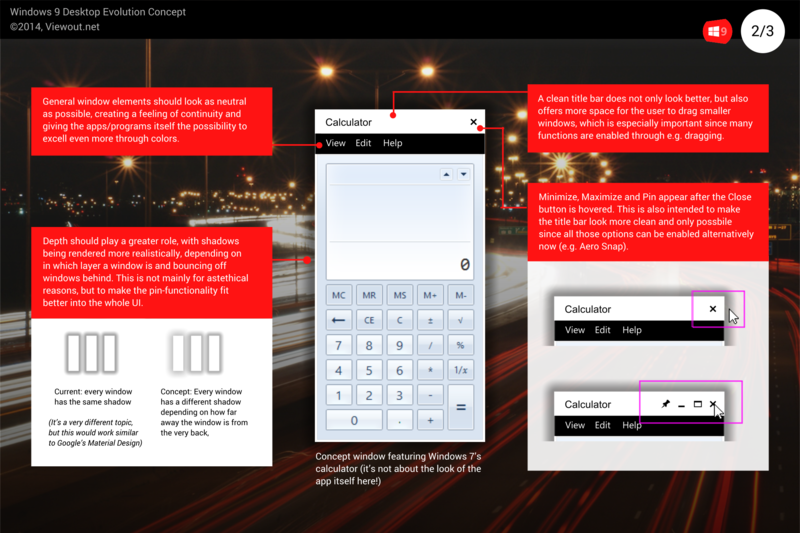 As already mentioned, this concept is not about the look of Windows 9, but about functionality. Moreover, I mainly want to introduce you to the so-called �pin�-functionality. There are of course also a few other small changes within the mock-ups, but the feature could work as well looking completely different. While usually always the window that the user has interacted with last jumps to the very top, this new function would make it possible to permanently �pin� windows to the very front. A pinned window will stay fixed at the front, even if the user is interacting with an other window behind it. The idea behind this is to excel the advantages of apps on the desktop. While Wikipedia still redirects you to �Mobile App� when searching for �App�, and defines it as a �program designed to run on smartphones, tablet computers and other mobile devices�, I�d rather say - especially keeping in mind that apps are also available for Windows 8 and Mac OS - that apps are small programs only dedicated to a single, simple task. 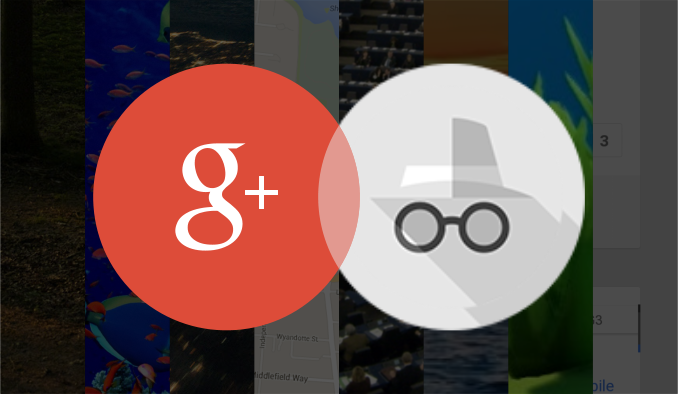 Of course you�ll also find plenty of more extensive apps (e.g. games), but the overall trend is shifting even more to this definition, thinking for example of the recent split of the Facebook Messenger, or the rumored upcoming split of Google+. On the desktop, apps would most likely be kind like little helpers that you take use of while working primarily on another window. For example, you might want to use a simple dictionary app while working on a document. 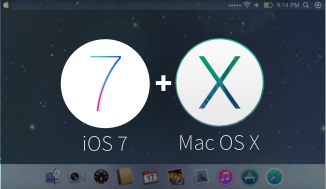 Currently you would most likely have to permanently switch between the two programs all few seconds. 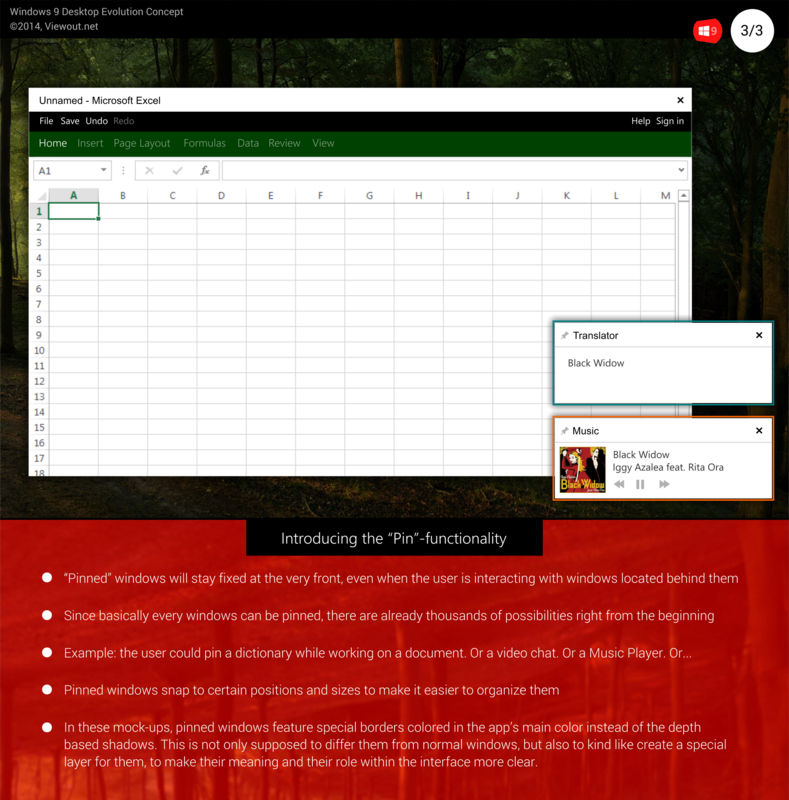 But taking use of this new feature, you could easily pin the dictionary and make it stay fixed in the bottom right corner, even while you�re continuing to work on the document. Besides of simply clicking on the new pin-button, you would also be able to pin a window more intuitively by double-clicking on the title bar. Since it�s only a special mode, basically every window could be pinned, even though it does of course make more sense to pin small, responsive apps. Additionally, the user can of course also pin several windows at the same time. Pinned windows can of course be resized or repositioned just like any other window. However, a pinned window will snap to certain positions and sizes to make it easier to organize them and also to quickly make several pinned windows have the same size. and there are most likely a million more such small extensions the user could take use of. I think these are really some great examples examples, emphasizing what power lies in this feature. At first sight, pinned windows look and also work very similar to Desktop Gadgets, a feature that was introduced 8 years ago as part of Windows Vista but was also already removed again 2 versions later. However, there are a few key differences between the two, which are making the pin-feature much more powerful and solving the reasons why Gadgets failed. While Gadgets were special programs with a different look, different control schemes and a different interface, pinned windows are basically completely normal windows. The pin-functionality would not introduce a completely new, unnecessary, separate layer to the GUI, but it would be a small add-on, building upon to the current interface. Gadgets were intended to be there for several sessions until you manually close them again, but in this concept, windows are only pinned temporarily. Once you�ve restarted your PC, the desktop is completely empty again. Gadget could only be chosen out of a very small special store, but basically every window that you�ve got installed can be pinned. 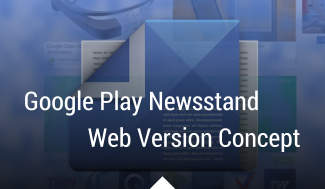 Even more so - thanks to the great rise of mobile apps - there are already tons of applications being responsive and perfectly adapted for the use in a small window. 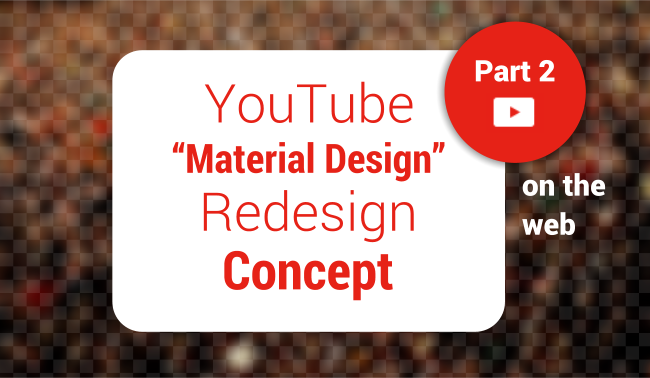 As already mentioned, this concept is not primarily about the design changes and look of the new feature in the mock-ups, but more about the functionality and idea in general. Nevertheless, to make the pin-feature work best, Microsoft would have to make a few adjustments to the desktop. The first problem is that currently small windows look rather odd, featuring unreasonably large borders, a very messy title bar, and only very few space left for the user to drag the window. Since the whole pin-feature heavily relies on them, small windows would have to become much �cleaner�, which would by the way actually also improve their appearance. As part of Windows 7, Microsoft already introduced several very clever and intuitive new ways to control a window (e.g. dubbed �Aero Snap�). One of them was the possibility to maximize a window by dragging it to the very top. Building upon this, windows should as well be minimized dragging them into the task bar, and closed dragging them over the notification area (while holding the window, the notification area would transform indicating it�s temporary new task). I�m very sure that this won�t be coming with Windows 9, even though it would be a great addition, adding tons of value to the desktop and opening for completely new working scenarios. In addition, the feature would also be a good answer to the question why apps are necessary on the desktop at all, and it would also give the Windows Store more importance and more reason to exist on the desktop. What�s your opinion about this? Do you also think the possibility to pin windows would add much value to the desktop? Or do you think it would mess the whole interface up? Have you ever taken serious advantages of Vista�s Desktop Gadgets?